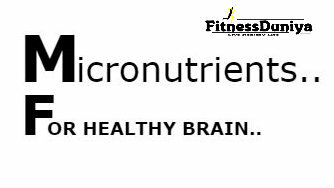 Micronutrients which are very important for our mental development and especially for children of growing age. Many times it happens that we are taking good care of the diet but still the lack of some essential ingredients in our food which is necessary for our physical and mental development.We are talking about the micronutrients these include zinc, manganese, selenium, iodine, copper, iron, molybdenum etc.We should include all these elements in our diet so that the children of growing age grow well and get healthy life.Micronutrients are a class of organic compounds found in many diets. Micronutrient are essential for maintaining good health of the body,brain development and in very small quantities for normal functioning, so these are kept under the category of micro-nutrients.Some studies, research have reported that more than 50 percent of children look healthy but they are found in many ways that the defects of micronutrients have been found.These micronutrients are also necessary for the proper metabolism of body cells and tissues and to work properly.The most decrease in which iodine, iron and zinc were found. Many new researches prove that there is a bad effect on the development of the brains of young children when there is no nutrient on time. So take care of your children's diets understand the needs of nutrients or meet the doctor for better suggestion. Iron rich foods - LENTILS,BEANS,FLAXSEEDS,POTATOES,TOFU,WATER-CALTROP,SPINACH. Zinc rich foods - NUTS,DARK CHOCOLATE,MUSHROOMS,PUMPKIN SEEDS,CHICKEN,BEANS,OYSTERS,WHEAT,GARLIC. Manganese rich foods - CABBAGE,SPINACH,NUTS,LEAFY VEGETABLES. Iodine rich foods - CRANBERRIES,YOGURT,BEANS,STRAWBERRIES,RAW CHEESE,SEA-FOODS,EGGS. Copper rich foods - LENTILS,ALMONDS,ASPARAGUS,DARK-CHOCOLATE,SUNFLOWER SEEDS,DRIED APRICOTS. There are many more options in foods for complete your deficiency of micronutrients in a natural way such as milk,cashews,eggs,sardine,turkey,oats-brown rice,dairy products,olive oil,avocado,salmon fish,kiwi,apples etc.